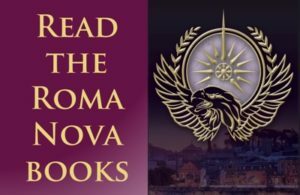 Storytelling in Roman societies covered stories (fabulae) from the classics through philosophy, politics, religion and travel to sheer entertainment. Professional storytellers would be hired to entertain after dinner parties and other special events. And a good storyteller was a valued travelling companion because travel was mostly a slow, boring process in the ancient world. 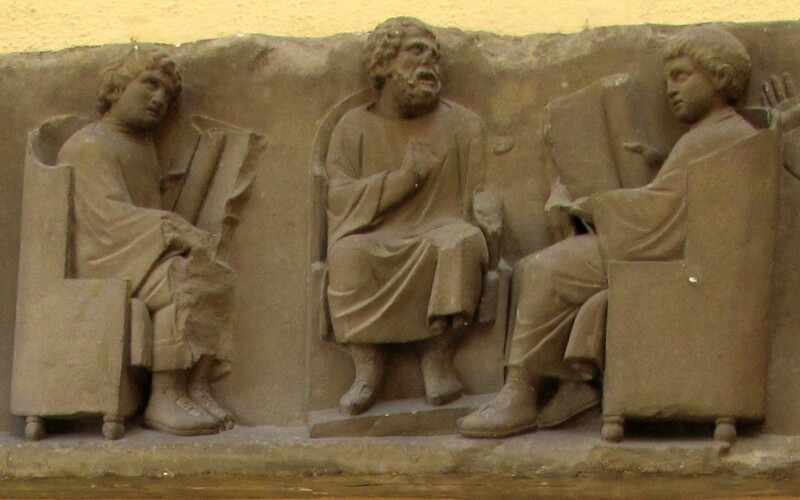 Almost nothing is easily accessible about the storyteller in the ancient Roman world and the little information that exists is incomplete and difficult to track down. We do know that during the first and second centuries AD a fairly large quantity of literature circulated widely throughout the Roman empire. Educated slaves seemed to have been available in sufficient numbers to have reproduced a significant number of books. We don’t have records of the Roman book trade but the surviving literature of the same period shows that much of it travelled weIl beyond the city of Rome and that a reasonable proportion of the inhabitants of the Roman world were literate, something necessary for a book trade to prosper. 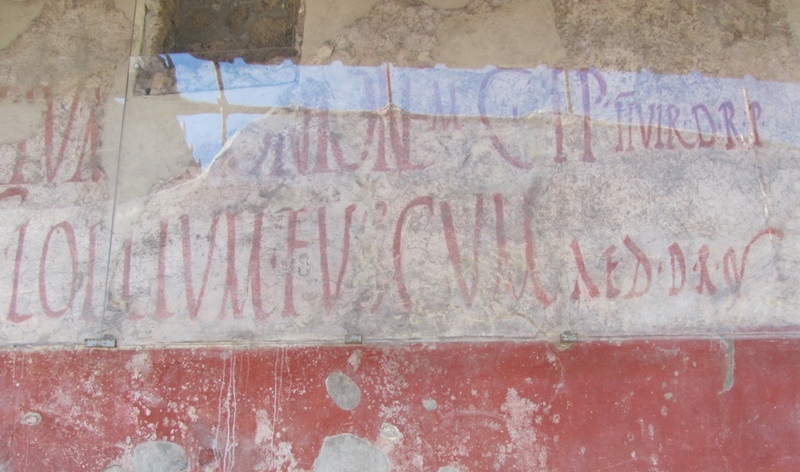 Apart from books written for and by the ruling classes of Roman society, we know from thousands of scrawlings of wall at Pompeii and other (often remote) sites of the empire that literacy was widespread, even if the results were rude or defamatory! Graffiti from inns, restaurants, barracks and brothels suggest that slaves, legionaries, shopkeepers, mule-drivers and other members of the Roman working classes enjoyed a reasonably high level of literacy. However, many workers in country districts were thought to be illiterate according to remarks by writers such as Quintilian and Strabo. The former mentions ‘rustics’ and ‘illiterates’ as being enthusiastic listeners to Aesop’s fables and the latter makes interesting remarks about the fondness of illiterate and semi-literate people for children’s stories. But learning and writing did not preclude the presence of itinerant professional poets or popular storytellers who could tell stories of the great and the good down to the ordinary man (or woman) in the street. Such a storyteller in antiquity was often just one member of a large group of entertainers who earned a living by practising their assorted skills in the towns and villages of the Roman empire. Canny storytellers probably made their visits coincide with local festivals and fairs when people from the countryside were looking for entertainment in the form of a public performance or spectacle.The Latin terms for storyteller, fabulator and aretalogus, do not indicate whether they were itinerant or not. Neither word conveys much more than the basic meaning ‘storyteller’. 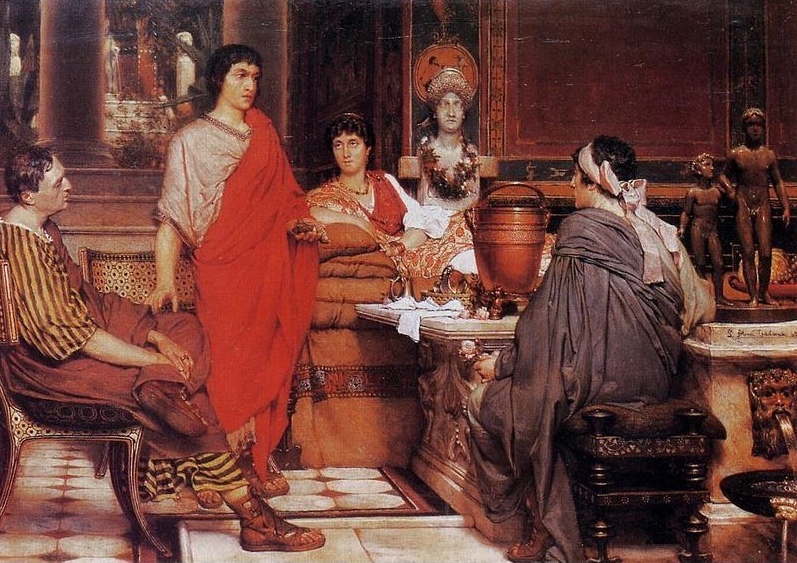 Suetonius tells us that Augustus employed them for two distinct purposes: firstly, to entertain guests at his dinner parties along with other entertainers, secondly, to lull him to sleep on nights when his sleep was interrupted when he summoned readers or storytellers (jabulatores). Sadly, Suetonius does not give us any information about Augustus’ successors’ use of storytellers. Although some wealthy Romans kept storytellers, we don’t know whether they formed a permanent part of Augustus’ household, or were summoned at short notice by a palace servant from public places at Rome such as the Circus Maximus, Forum, or the hippodrome. Pliny mentions fabulatores in a letter which opens with the catch-cry of a professional storyteller: “Pay a penny and hear a golden tale”, possibly the cry of a popular fabulator addressing bystanders prior to giving a public performance. Juvenal mentions an aretalogus who seems to have been more of a religious or temple storyteller, although there is controversy about this and about whether they were itinerant or attached to a specific temple. 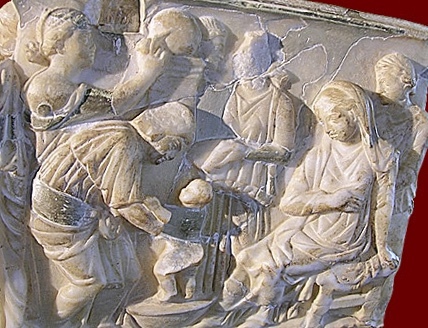 Child’s first bath is depicted on one side of the marble sarcophagus for a dead child. The nurse lifts the baby who has just been born, while his mother, supported after the birth by a female servant, watches. Roman, second century CE. Agrigento, Museo Archeologico Regionale. The many references in Greek and Latin literature to ‘old wives’ tales’ shows clearly that nurses, who in the ancient world were usually slaves, were the main keepers and retellers of Graeco-Roman folktales. But literary snobbery flourished then as now. The term anilisfabula, was the ultimate insult that a literary critic could apply to a writer’s work, or that anyone could apply to another person’s speech. Any fabula which lacked a proper message or which was not delivered in an instructive context, i.e. a tale which was told for its own sake for entertainment was relegated by the ancient world’s severest critics to the nursery. Such is the opinion of Macrobius who condemns the romances of Petronius and Apuleius, and packs them off to the nursery (in nutricum cunas). Some storytellers may have remained in one city if it was large enough and attracted large numbers of visitors. Other storytellers in the Eastern Mediterranean were attached to religious centres, especially to those of Egyptian deities, and their main task was to popularise the miraculous deeds of the god or goddess whose cult they were promoting. It’s a pity that so little is recorded in ancient literature about professional storytellers; it could well be due to the anti-plebeian bias of most ancient literature. The hostility of ancient literary critics towards literature which did not exhibit a recognisable purpose or lesson, or which did not pay proper attention to authenticity and literary conventions is something that has endured to the 21st century. A great subject and good reflections. 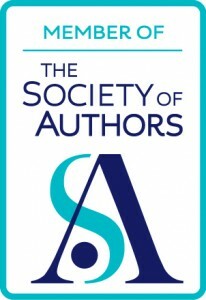 At least the publishing industry is more democratic now than it was (for better and for worse). 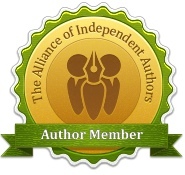 Always love stopping by at your blog. Takes me back to my Latin lessons ages ago. Happy New Year! Felix sit tibi novus annus! Fascinating information and illuminating pictures. Thank you, Alison. Thank you! Storytelling is a fascinating subject, whether sitting in the market place 2,000 years ago or listening to an audiobook today.